Sure, the running theory is, "Werth had every right to be pissed. That foul ball could've lost the game! But it's not as if father pulled a Bartman. Werth should offer even a half-hearted apology." Fast-forward to the next night (which would be Friday). 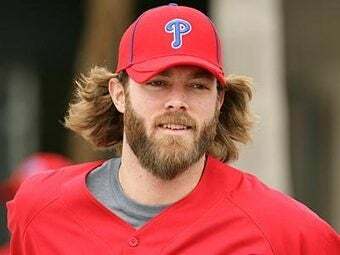 Before the Phils/Reds game, Werth dutifully goes before the cameras and tape-recorders: "Obviously I feel bad for the guy and the kid and the people that were sitting around there. It was definitely out of character a little bit. I don't feel bad about playing hard and going after balls in the stands and stuff like that. It's just one of those deals. It is part of the game. ... I'm assuming people are upset, but to me it was just something that happened and I moved on right after." Haters will maintain Werth still hasn't apologized. And he probably won't. Everybody else? "Who friggin' cares? Werth went 2-for-3 with an RBI in a season-saving six-run bottom-of-the-ninth comeback? The Phillies are back, baby!!! Besides, they're gonna trade Werth for Cliff Lee anyway. What's that, Cliff Lee went to Texas? In that case, screw Werth. He should've went 3-for-3."